Overview: Oden’s book is broken up into two parts. The first addresses Moltmann’s theology as it relates to the Church, and the second engages that theology with contemporary Church movements, such as the Emerging Church. As a study of Moltmann’s thought, this book soars as a careful look at Moltmann’s key interests and by providing a much needed focus on Moltmann’s ecclesiology. I read this book primarily for its first part, which studies Moltmann, and my review will therefore focus on Oden’s work on Moltmann’s theology. While it should be noted that the second part was indeed fascinating, I am less capable of commenting on its success than I am on the first part. There are many publications available that focus on Moltmann’s first two books, Theology of Hope and The Crucified God, but there has sadly been less of an interest in Moltmann’s profound contribution to ecclesiology (the doctrine of the Church), which was the focus of his third book, The Church in the Power of the Holy Spirit. Oden’s study provides a much needed contribution to correct this problem, and shows exceptionally well the importance of Moltmann’s understanding of the Church as an essential aspect of his overall theology. Just as hope and the suffering of God are essential to nearly every work Moltmann wrote, so his understanding of the Church is integral to his whole theology. Oden reveals this in his careful and thoughtful study of Moltmann’s major works. Oden writes his study with an attention to detail as well as an approachable style, which makes this book a helpful guide to Moltmann’s theology, as well as a fascinating look into a dialogue possible between his work and the different models within the Emerging Church (Oden lists four variations). This example shows how well Oden is able to highlight important insights from Moltmann’s theology for the Church today. This was the case for nearly every section he wrote on Moltmann’s thought, in which he carefully and clearly articulates the important points from each of his major books. I enjoyed this book very much, and found these sections to be very insightful for a better understanding of Moltmann. Conclusion: Oden’s book is well worth reading, not only for the first part which masterfully deals with Moltmann’s theology, but for the whole premise of the book which strives to provide a transformative model for the Church. I’d recommend it both for those interested in how Moltmann’s theology might work in a dialogue of this sort, but also for those searching for a good overview of some of his essential convictions from the perspective of his ecclesiology. My thanks to Fortress Press for a digital copy of this book for review. I was under no obligation to offer a positive review and have presented my honest reflection on this work. Overview: Theology as Hope is a carefully written, thoughtful book, which studies Moltmann’s major “Contributions to Systematic Theology” within the light of his theology of hope. For Neal, this is Moltmann’s chief method, “theology as hope.” While he is ultimately critical of the success of Moltmann’s project, he nevertheless provides a fair and helpful reading of his work. I was impressed by this book. It is a clear overview of Moltmann’s theology from the conviction that his central method is “theology as hope.” while I wouldn’t call it an introductory study, it still gives a nice overview for those who might have a decent grasp already of Moltmann’s thought, but who perhaps have a few questions about precisely what Moltmann means. (Though Bauckham’s work will always be the standard for secondary literature on Moltmann.) Notable is his clarity in dealing with Moltmann’s controversial “social doctrine” of the Trinity. He provides a helpful response to critics of this notion that I thought was very well put together. Another strength of this book was Neal’s ability to recognized nuances in development in Moltmann’s theology, so that he often made note of the precise areas where Moltmann progressed in his theology, or acted in a self-correcting manner, or when he flatly changed his mind. It is very helpful to read Moltmann within this context, because some of his earlier work is admittedly “one-sided” and it becomes useful to see where and how he corrects some of these tendencies. This is perhaps the greatest value I found in reading the book, as Neal pays careful attention to these details. “1. The Father… is the ‘rejecting Father.’ First, the Father does not hear the prayer of the Son in Gethsemane, and then on the cross is continually silent as he abandons the Son to death. So, the Father suffers as the one abandoning his Son. 2. The Son… is the abandoned Son. The first part of his plea to the Father (Abba): ‘remove this cup from me’ goes unanswered, while the second half ‘yet, not what I want, but what you want’ is answered according to the Father’s will. So, the Son suffers actively as the one who both ‘through the eternal Spirit offers himself without blemish to God’ and passively as the one abandoned by his Father. The first and second proposals are included in Moltmann’s The Crucified God, but this third aspect is where Neal sees as a development (and improvement) upon his theology of the cross. I’ll have to go back and re-read the sections he refers to in order to understand all the points here, but it was interesting to see this development spelled out so carefully. There are various other comments Neal makes that are helpful in this same regard, as he expertly traces Moltmann’s development on numerous issues. Perhaps this is just something I have not yet studied for myself as fully, but it struck me as a valuable aspect of the book. Neal’s conclusion in the book was also interesting to read, though he takes a critical tone on the success of Moltmann’s theology of hope which I’m not quite sure I can follow. In a poor restatement of Neal’s conclusion, it seemed like his conclusion was that Moltmann’s theology of hope fails to be a theology of hope and is more accurately a theology of certainty (especially in Moltmann’s explicit universalism). Thus, he criticizes Moltmann’s Theology of Hope and his Coming of God perhaps the most strongly. Conclusion: Generally speaking, I enjoyed this book for how carefully and thoroughly Neal wrote, as well as the attention he gave to the development of Moltmann’s thought. I’m not wholly convinced by his conclusion, but I found my understanding was challenged by it. I think this fact is a great sign of a successful book on Moltmann, since he was himself so dedicated to theology as a dialogue, or as he called it “an adventure of ideas” in which his “whole concern has been, and still is, to stimulate other people to discover theology for themselves” (Experiences in Theology, preface). My thanks to Pickwick Publications and Wipf & Stock Publishers for a digital copy of this book for review. I was under no obligation to offer a positive review, and have presented my honest reflection on this work. When our Earthly/bodily life is not loved, affirmed, and accepted, we either resign ourselves to a religious escapism or numb our senses with hedonistic pleasures. Moltmann’s ethic of hope insists that a truly Christian ethic, based on the bodily resurrection of Christ, says Yes to this life; it must include a love for our life on this Earth as human beings (not as disembodied souls). A few years ago I wrote a book called 10 Reasons Why the Rapture Must Be Left Behind (free as an eBook). One of the ten reasons I argued against the rapture was that it promotes a kind of gnostic escapism. The rapture plays into the idea that we do not have to take care for this world (the ecological crisis is a result, in part, of this neglect), that we are not responsible for the Earth, and that we do not belong to it—because one day we will escape the Earth for a spiritual world somewhere else, while this world is annihilated. Overview: This volume represents a fair and surprisingly appreciative engagement with Moltmann from the evangelical perspective. The weight of the book is on first understanding Moltmann before offering any criticism. As in any collection of essays such as this one, there are always essays that stand out among the rest. This volume is no different. After I read the first essay in this book, written by Sung Wook Chung of scripture, I expected the rest of it to be largely negative. But I was pleasantly surprised. No essay is completely free from criticism, but the bulk of the essays fairly considered and appreciated the benefits of Moltmann’s theology. It was a breath of fresh air. Most of evangelicals I’ve come across outright reject Moltmann as a heretic. They attempt to fit him into any number of labels (universalist, Marxist, open theist, etc.—however accurate or inaccurate) in order to downplay the significance of his thought. But this book does an excellent job truly celebrating the benefits evangelical theology might gain by engaging in a dialogue with his many contributions. If this book becomes a standard for the relationships evangelicals have with Moltmann, than there is tremendous hope for a profound future dialogue and mutual appreciation. The second essay was a sharp contrast against the first. Kurt Anders Richardson’s essay on “Moltmann’s Communitarian Trinity” was my favorite from the book. He treats Moltmann’s doctrine of the Trinity with the care it rightfully deserves. Many of the myths that surround Moltmann’s theology were dispelled. One myth is Moltmann’s supposed Marxism. Richardson writes: “The Theology of Hope was actually a non-Marxist, Christian answer to Marxists.” 2 Richardson argues it is because many fail to understand the political background Moltmann writes within that they mistake him as a Marxist. He certainly appreciates elements of Marx, especially through his appreciation of Ernst Bloch; he is not, however, properly understood as writing a Marxist theology, but a Christian alternative to Marx. Richardson also dispels the wrongful conclusion of patripassianism in The Crucified God. Patripassianism is an early modalist heresy that believed the Father suffered and died on the cross. Moltmann does argue for the grief of the Father in giving up His Son to death, but he does not confuse the death of the Son with the grief of the Father. The Son dies, and the Father suffers the loss of the Son. The label of patripassianism is wrongly applied, though some of the less attentive critics of Moltmann have jumped to that conclusion. Against the charge that Moltmann is constructing an “extra-biblical” doctrine of the Trinity, Richardson writes: “This does not mean that Moltmann is thinking extra-biblically. On the contrary, there is much that is more biblical than the classic trinitarianism of speculative theology. It must be realized that all of the non-personal metaphors for Trinity are extra-biblical. What counts are the relational metaphors and signs of eternal relationships.” 3 This is a helpful clarification for critics of Moltmann’s “social” doctrine of the Trinity. He is thinking through with complete seriousness the doctrine of perichoresis, and as such Moltmann should be considered less speculative than those who argue for a metaphysical doctrine of God. Richardson’s essay is a careful treatment of Moltmann’s thought, and certainly stood out as one of the best in the book. But I also enjoyed the Veli-Matti Kärkkäinen’s essay on Moltmann’s pneumatology. The only real problem I have with the book is how repetitive it was, which made it rather boring to read even though each essay was so well written. This was because most of the essays repeated near identical biographical remarks or offered a short overview of his major books (or both). This made reading the essays, especially the first part of each, a chore. Even if I wasn’t familiar with Moltmann’s story or the development of his thought, I would find the repetition of this unnecessary. It is more of an editorial issue, however, and not directly the problem of the writers themselves. I wish the editor was more attentive to removing unnecessary repetition. Conclusion: If this book is any indication of where the dialogue will go between Moltmann’s theology and evangelicals, then it is an excellent step forward. I recommend it for those who might find themselves on either side: whether you are an evangelical interested in Moltmann but unsure about him, or if you are appreciative of Moltmann but doubt there can be any evangelical dialogue, this is a helpful book. My thanks to Wipf & Stock Publishers for a digital copy of this book for review. I was under no obligation to offer a positive review, and have presented my honest reflection on this work. I’ve been reading Moltmann recently, and just came across a quote bearing profound relevance for American politics today. The Second Commandment, “You shall not make yourself a graven image…” is particularly relevant when we consider the political idols we create for ourselves. Luther wrote, “Whatever you set your heart on and depend on, that is really your god.” And this applies no less to religious idols than it does to political idols, whether these are called “America,” “Republican,” “Liberal,” or anything else. Political idols are not absent from America. We often fail to recognizing ourselves as a “factory for idols” (Calvin), but it is an undeniable truth we must recognize. We create idols daily. And, according to Moltmann, the only destruction of all our idols, political or otherwise, is the cross of Christ. When we see the power of God in the weakness and suffering of Christ, we no longer have valid justification for a top down power structure. In other words, we no longer have ultimate justification for faith in a political power, in a country, in an ideology. The only justified faith in the light of the cross is faith in the crucified God who takes the side of the weak, powerless, suffering, poor, and broken. In a world where success and achievement are the highest good, we, in the name of Christ, must protest against all cultural idols of power, no matter what name they bear. If, for example, the idol of power goes by the name “America” or “nationalism,” then it becomes a Christian obligation to resist and protest against this power structure which tramples on the weak and idolizes the successful. Think of the recent controversy surrounding the NFL and their protesting athletes, taking a knee during the National Anthem. By giving a voice to the voiceless, to those who are forgotten and ignored in our success culture, these athletes stand on the side of the crucified Christ who suffered as an outcast for the cause of the outcasted. Liberation from this anxiety is only in the cross of Christ, when we recognize that this is God’s Christ suffering and dying as an outcast, as a political tool, in solidarity with the weak, poor, and helpless. The cross is the ultimate undoing of all our idols of success and power. Even if that idol is named “America,” we are obligated as Christians to protest in the name of the crucified Christ, who is triumphant in suffering and weakness, who is on the side of the poor and the outcasted. To those of you angered by these protests, I want to ask you: Where is the cross of Christ? Do you see Christ on the side of the rich and the successful refusing to give a voice to the voiceless? Or, if you’re honest, don’t you see Christ in the eyes of those protesting in the name of the violence done to the poor and weak? Few people groups suffer more violently and more often in our country than the African-American. By silencing their protests, be careful you are not turning a deaf ear to the suffering cry of Christ in solidarity with the weak. May our idols of power come undone at the cross of Christ. And may we be attentive to listen to Christ’s cry of solidarity with the weak and the voiceless. I have just shared about Jürgen Moltmann’s letter to me, which you can read here in its entirety. But I wanted to highlight a moving aspect of that letter, namely, Moltmann’s response to my question about Donald Trump as the new president of the United States. I wrote my letter in February, during the time when Trump was attempting to ban Muslim’s and block Syrian refugees from entering the country. This was (thankfully!) blocked and deemed unconstitutional after protests and political opposition arose all around the country. But my concerns regarding the current president have not ceased, and Moltmann’s response beautifully summarizes all of the reservations which I have felt regarding our current president. In my opinion, Donald Trump’s America is the antithesis of the best principles America was built on, exemplified clearly in the poem inscribed on the Statue of Liberty, “The New Colossus”: “Give me your tired, your poor, / Your huddled masses yearning to breathe free, / The wretched refuse of your teeming shore. / Send these, the homeless, tempest-tost to me, / I lift my lamp beside the golden door!” But it is not only as an American that I am hesitant about Trump, but also as a Christian; I can’t help but think Trump’s America follows the path of a violent empire, which is not the way of the kingdom of God. I was honored to receive a letter today from one of my theological heroes, the great German theologian of hope herr professor Jürgen Moltmann. I wrote professor Moltmann in February, and had almost given up “hope” that I’d ever hear a response. This was before checking my mailbox today to find this greatly-anticipated letter from Germany, much to my excitement! I wrote Moltmann primarily to thank him for his books and for the profound impact they have had on my faith and theology. Readers of my articles and books will know that I consider professor Moltmann to be one of my three favorite theologians (with Barth and Torrance). I consider him, without any hesitation, the greatest theologian alive today. His work has had a profound impact on me ever since reading his masterpiece, The Crucified God, almost four years ago. In 2014 I wrote a short (if slightly premature) book that wrestles with Moltmann’s “theodicy”, entitled Where Was God? [LINK]. I am currently preparing to research and write a more fully-fleshed book on Moltmann as a part of my “Theology in Plain English” series. I also plan to write a book on Moltmann and Samuel Beckett, one of my favorite literary authors. 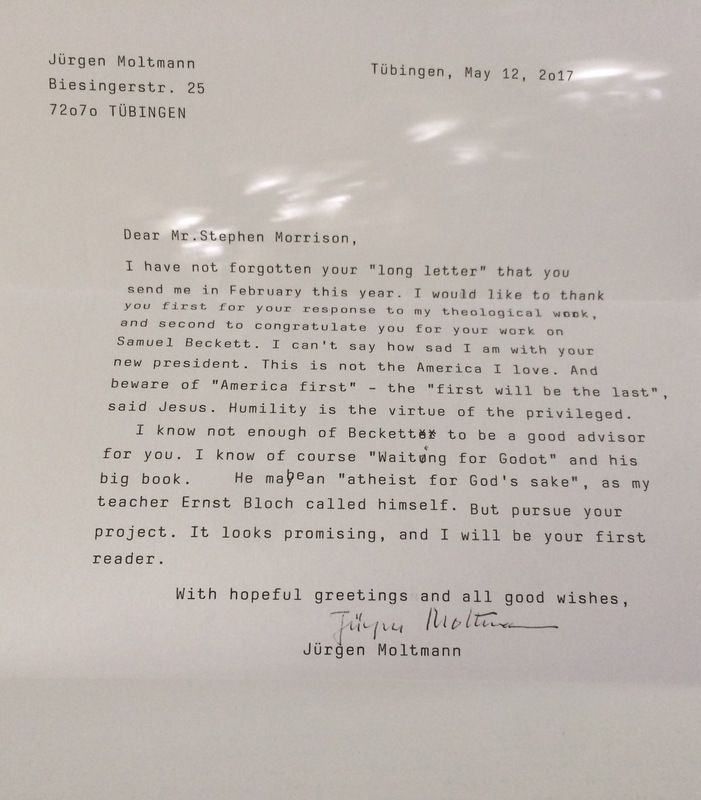 So it goes without saying, I am deeply grateful for the theology of Jürgen Moltmann, and I was honored to receive this personal letter! I asked Moltmann two questions after profusely thanking him for his theological work. First, I asked about the current president of the United States, Donald Trump. Like many other Americans I am profoundly disturbed with the president; I find many of his policies to be the very antithesis of the way of Jesus Christ. It shouldn’t be a surprise to those familiar with Moltmann to learn he also responded with sadness about our president, writing, “I can’t say how sad I am with your new president.” Second, I asked Moltmann if he has any comments about Samuel Beckett, and I mentioned my interest in placing his theology into dialogue with Beckett’s literary project. To this Moltmann said he is mostly unfamiliar with Beckett, but encouraged me to pursue the project. My thanks again to professor Moltmann for kindly responding to my letter! Today we continue “Moltmann-March” with a quote contrasting Moltmann’s understanding of loving God as gladly existing, and Augustine’s understanding of loving God as rejecting existence and hiding in the innermost self. This quote comes from Moltmann’s excellent book The Source of Life: The Holy Spirit and the Theology of Life. For other recommended books by Moltmann, check out last week’s article. For now, enjoy this fascinating match-up between Jürgen Moltmann and St. Augustine on loving God! “For a long time I looked for you within myself and crept into the shell of my soul, shielding myself with an armour of inapproachability. But you were outside—outside myself—and enticed me out of the narrowness of my heart into the broad place of love for life. So I came out of myself and found my soul in my senses, and my own self in others. In my email newsletter I dubbed this March a “Moltmannian-March” in celebration of the theology of Jürgen Moltmann. To kick off the celebration here’s a list of books to check out by or on Moltmann, for either an introduction to his thought, or to study a particular subject. Enjoy! Jesus Christ for Today’s World — this is my go-to recommendation for anyone wanting a clear and concise introduction to Moltmann. Many of the major themes of Moltmann’s theology can be found here, and they are presented in a very approachable manner. The Living God and the Fulness of Life — released last year, this is another great introduction to Moltmann, especially to his mature work. It’s a continuation of his early book The Spirit of Life, but contains a great discussion of God’s omnipotence in a manner essential to Moltmann’s thought. I’ve written up a bit on this book here. In the End—the Beginning — this is a good introduction to Moltmann’s eschatology for those daunted by the difficult Theology of Hope or the thorough The Coming of God. A great resource, and clearly written. A Broad Place — this is Moltmann’s auto-biography, and an essential book for understanding not only the theology by the theologian himself, his development and life. The Crucified God — why not begin with this famous book which established Moltmann as a foremost theologian of our time? This was the first book I read by Moltmann, it’s accessible enough for anyone to tackle. Go for it! The Trinity: For Moltmann’s work on the Trinity, check out The Trinity and the Kingdom. This is also a fascinating work on the suffering of God. It’s my personal favorite book Moltmann has written, it’s a beautiful study. Eschatology (last things): I’ve mentioned these already, but for Moltmann’s eschatology check out Theology of Hope and The Coming of God. The latter contains Moltmann’s fullest treatment of eschatology, while the former is his famous thesis that all theology should be eschatologically oriented. Pneumatology (Holy Spirit): Moltmann’s major work on the Holy Spirit is in The Spirit of Life: A Universal Affirmation. Also check out The Source of Life for a shorter book on similar themes. The Living God and the Fulness of Life, as I’ve already mentioned, is also an important book for Moltmann’s thoughts on the Spirit of God. These books were particularly fascinating to me, as I’m someone who grew up in a charismatic/methodist church. Christology (Jesus Christ): Moltmann’s dedicated book of Christology is The Way of Jesus Christ. It’s a very fascinating book, which offers a unique perspective on the doctrine of Jesus Christ. Creation: God in Creation is Moltmann’s doctrine of creation, in which he presents his panentheistic vision of the world God made. A fascinating book. I’ve written some about this idea here. Ecclesiology (the church): Though I haven’t gotten around to reading it yet, The Church in the Power of the Spirit contains Moltmann’s ecclesiology, his doctrine of the church. Here are a few more notable books that I’ve read and enjoyed by Moltmann, but which don’t necessarily fit into either of the above categories. God for Secular Society. I shared a great quote from this book here. The Passion for Life: A Messianic Lifestyle. Jürgen Moltmann: Collected Readings. A “greatest hits” sort of book. Experiences in Theology: Ways and Forms of Christian Theology. This is one I’ve had on my shelf for way too long without reading it. But it’s another great one to check out. These are books by others writing about Moltmann. I haven’t spent much time reading secondary literature on Moltmann, but there are a few notable books worth checking out to explore Moltmann’s thought. Though I’d always recommend reading Moltmann and forming your own opinion of him firsthand before ever reading opinions from someone else. The Annihilation of Hell by Nicholas Ansell. This is an excellent study on Moltmann’s (hopeful) universalism. I’ve written several article on this book. Here’s my review and another post exploring Moltmann’s “Certain” hope. I highly recommend this book, so much so that I named it among my 12 favorite books for 2016. Perfect for anyone interested in Universalism and Moltmann. Richard Bauckham is often considered to be one of the leading scholars of Moltmann, and his two books are well worth checking out: The Theology of Jürgen Moltmann and God Will Be All in All. The latter deals specifically with Eschatology, and includes several chapters by Moltmann alongside Miroslav Volf and Trevor Hart. And would you allow me a little shameless self-promotion in closing? I’ve written a book on Moltmann that I think is worth checking out. It’s called Where Was God? In this book you’ll read a fictional conversation between four friends discussing in the theodicy question. The purpose was to contrast Moltmann’s answer to God and suffering with three other answers common to theology and philosophy. Best of all this book is yours free when you sign up for my Readers’ Group. But you can also get a physical copy through Amazon. Okay, self promotion over. Now go and read some Moltmann! Happy March, and happy reading!